The Premiair PDDS10 is a dehumidifier for use in the home but operates in a way completely different from a refrigerant dehumidifier. Instead of condensing the moisture from the air on a cold coil the PDDS10 "captures" moisture on a desiccant material. Many materials have desiccant properties and perhaps the most commonly known example is table salt. If salt is left exposed to the air for any length of time it becomes damp and if left long enough eventually has a paste-like consistency. The desiccant material used in dehumidifiers is like salt but attracts and holds water much more quickly. The advantages of desiccant dehumidifiers arise from the fact that no refrigeration process is involved and they do not, therefore, require a compressor, condenser and evaporator coils. This makes them lighter, smaller and somewhat quieter than refrigerant models. An additional advantage is that a desiccant dehumidifier can operate effectively at low temperatures. In refrigerant models the formation of ice on the cold coil degrades and eventually stops the dehumidification process making these units largely ineffective below 15°C. A desiccant dehumidifier can operate at near-freezing temperatures, a great advantage in very cold areas. The Premiair PDDS10 Desiccant Dehumidifier is a medium capacity unit with the power to remove 9 Litres of moisture every 24 hours from air at 30°C and 80% relative humidity. It is difficult to compare a desiccant dehumidifier with a refrigerant type but it is probably fair to say that this unit is roughly comparable with a 20 Litre per day refrigerant model. The difficulty arises because refrigerant dehumidifiers perform best at comfortable room temperatures, about 20°C and above, and in the higher ranges of relative humidity, above 50%. In these conditions a desiccant dehumidifier will be effective but less efficient (i.e. it will cost more to run). At lower temperatures, below 15°C, a refrigerant dehumidifier will be less effective than a desiccant model and its effectiveness will decrease more as the temperature falls. The effectiveness of a desiccant dehumidifier, measured by volume of water collected, also falls as temperature and relative humidity fall. Claims that desiccant dehumidifiers collect "x" litres of water, regardless of the temperature, are difficult to substantiate. The true measure of effectiveness, however, is not how much water is collected but the degree by which relative humidity is reduced. On this measure a desiccant dehumidifier wins hands down at low temperatures. There are other reasons why a desiccant dehumidifier may be preferred which arise from the fact that a desiccant dehumidifier does not need the refrigeration system which is at the heart of the refrigerant process. The component parts of these systems are bulky and heavy and make the dehumidifier bigger and heavier too. The Premiair PDDS10 is a compact unit because it dispenses with these components and has dimensions of only 43.0 x 19.0 x 52.0cm, a clear benefit. The Premiair PDDS10 is also light-weight at only 8.1kg, another clear benefit. A third advantage of a desiccant dehumidifier is its lower noise level. The compressor in a refrigerant dehumidifier is a source of noise and a dehumidifier without a compressor will be less noisy. The compressor is, however less noisy than the fan and a desiccant dehumidifier has a fan, usually two fans. A fan is indispensable as it is needed to draw air into the unit and to expel dried air. The Premiair PDDS10 has a noise output of 41dB which is lower than most refrigerant units of around 20 litres per day capacity. The difference is real but it is less dramatic than might be expected. The Premiair PDDS10 has variable fan speeds, including a "turbo" setting which may be used for laundry drying. At higher fan speeds the noise is greater but the dehumidifier is more effective. The PDDS10 is a useful laundry dryer because it directs the dried air upwards, increasing its effectiveness. The air it expels is considerably warmer than the air drawn in, which increases the drying effect. All dehumidifiers warm the air and a refrigerant dehumidifier emits air about 2°C warmer than the ambient temperature of the room. 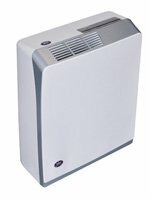 A desiccant dehumidifier such as the PDDS10 emits air 10°C to 12°C higher than the room temperature. This is because a desiccant dehumidifier "dries" the desiccant wheel, which captures the moisture, with a stream of warm air driven by a second fan. This warmed air is then returned to the room. The large heating effect is an advantage when drying laundry, in living areas in winter and in a cold environment, such as a garage. It is a disadvantage in warmer weather or for those who find sleeping in a warm room difficult. The Premiair PDDS10 deposits the water it collects in a bucket, of 3.5 litres capacity. The bucket will need to be emptied at intervals but this chore can be avoided using the continuous drainage feature of the unit. A narrow bore hose may be attached via an outlet in the dehumidifier through which the water may be discharged to a nearby drain. The drainage is gravity fed so the water must be running "down-hill" all the way. Mounting the unit on a raised surface will help with this. Continuous drainage allows the Premiair PDDS10 to be left unattended over a few days and a second feature that is helpful is the auto restart function. If there should be a power cut while the unit is operating the auto-restart will switch the dehumidifier back on when power is restored. Reference has already been made to the low temperature operating capability of the Premiair PDDS10. Its desiccant technology allows it to operate effectively at temperatures as low as 1°C. Only refrigerant dehumidifiers fitted with a "hot-gas defrost" system can compete with this and they tend to be significantly more expensive. The continuous drainage, auto-restart and low temperature operating capability of the Premiair PDDS10 make it particularly suitable for use in areas which may be consistently cool for weeks or months at a time and which it may not be convenient to visit once or twice a day. Garages and boats are two examples of this type of application. In summary the Premiair PDDS10 is effective, compact, light and relatively quiet. It provides a heating effect which is an advantage in some circumstances. The unit costs more to run than a refrigerant model but can perform in conditions in which most refrigerant type cannot. It may clearly be recommended for garages, boats and other cool environments and for laundry drying. It will be preferred for use in living areas by those for whom its advantages are more important than its drawbacks. Full details of the Premiair PDDS10 are presented in the table below.